Amongst other things in my month off, I spent a bit over two weeks in Africa. Most of that time was dedicated to shooting 4K video for a client, but since we were traveling through the Okavango Delta, the wildlife possibilities were attractive enough that I wanted to bring a still camera with me, too. Due to weight restrictions and the sheer amount of gear that shooting video entails, I ended up not having a lot of space in my backpack for a DSLR and lenses. In the end, I opted to carry a D7200 and an 80-400mm lens. That’s pretty much it. I had a Sony RX100IV and Panasonic LX100—note that both shoot 4K video, so they were partly backup for that—but nothing else. During the trip I managed to fill three 32GB cards with wildlife stills between shooting video. When the leopard started catching catfish at the mud-hole that was left of the dried up Savute Channel, I had the video camera locked down on the action on my window mount and picked up the D7200 to snap a few shots (see below). It’s not every day you see a big cat fishing, after all. The question, of course, is was I satisfied with this compromise still situation, did I take any good photos, and was there anything I missed by not bringing my higher end gear? Let’s start with some photos. This was a real autofocus acquisition test. I was actually facing the opposite direction in the vehicle when I heard a commotion behind me. This is the first frame of a series, and I literally took it the moment my viewfinder had a subject in it. The D7200 found focus instantly. This is one of the differences in a DSLR and mirrorless still. Most mirrorless cameras cheat (even those with PDAF on sensor): they are using pre-focus to get the lens near the right focus point all the time. Unfortunately, that doesn’t work in this situation, as the camera wasn’t actually pointed at the subject until the last moment before I pressed the shutter release. What happens with the mirrorless cameras in this situation is that they miss the shot. Note that I wrote that this was the first shot in a series. Some mirrorless cameras would have likely caught up by the second or third frame. Still, moments are moments, and once missed, can’t be recaptured. Also, note that a mirrorless camera would have needed a 600mm equivalent lens that autofocuses, too. That leaves out most of the mirrorless bunch right there. But given my experience with the couple of mirrorless options that get me equivalent, I’m pretty sure they wouldn’t have caught this shot. The one exception might be the Nikon 1 with the 70-300mm CX lens. However, it doesn’t always nail that first shot, either. While you might not be able to tell at this small size, this is a mid-air “kill.” In the bird’s left claws is a large grasshopper he caught mid-flight. One thing that constantly surprises me about the D7200 is how well it handles moving-subject-against-busy-background. I don’t remember the other Nikon consumer DX cameras managing to figure this out so well. The pro Nikon DSLRs, of course, have always done this well. 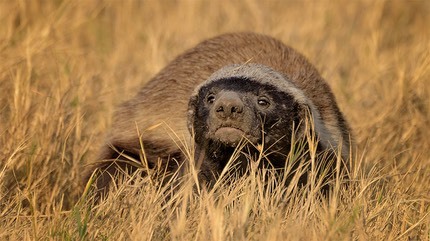 It seems like every other trip to Africa turns out to be a Honey Badger trip. These animals are not just difficult to find, but they don’t tend to stick around when a vehicle shows up and they’re so low to the ground that getting a decent shot is far trickier than you might guess. That grass in front has a tendency to attract the focus system, so when you’re down low like this photographing something through the brush you need to be in full mastery of the AF system. That generally means using AF-On and getting on and off the button as necessary plus overriding autofocus with the manual focus ring when necessary. Yep, even elephant siblings steal each other’s food. Because I was mostly doing video on this trip, I spent quite a few afternoons in camp managing downloads and various other video chores instead of going out on drives. Apparently the elephants decided to help me out, because every time I stayed in camp I was visited by elephants. Believe it or not, this is 80mm, and I had to back up to get this shot. Positioning helps, too. In this case the eagle allowed me to get the vehicle to the position he had to fly to once he took off. Big birds have to take off into the wind, and they don’t like to fly through dense brush on take-off. So I knew where he was going to go, I just didn’t know if I could get there before he went. I told you I took a lot of bird shots. This Malachite Kingfisher is displaying mating behavior with her head feathers, just one of four distinct feature stylings she showed. Because this is a G-rated site, I won’t show the actual mating. Yep, that happened right on that branch and I had to zoom out ;~). Okay, a bit of a back story. The Savute Channel was dry for decades, then filled up for nine years, and now is drying back up, leaving only mud holes behind. In the mud holes are large catfish with nowhere to go. Amazingly, the catfish can survive for months in conditions like this: they just burrow down into the mud and wait for the water to return during the wet season. Unless, of course, a leopard happens by and decides it needs to reduce its cholesterol by getting some Omega Oils. I don’t have many stills of this leopard catfishing, because I was mostly keeping my 4K video camera on the action. I did manage to pick the D7200 up once while the leopard was mostly stationary to grab a few shots like this. However, I have to say this is one place where video tells the story and stills just ask a question. The video story is a leopard discovering the catfish, grabbing one, dragging it up into the trees and eating it, and returning multiple times to do the same thing. And trust me, the leopard was darned tired by the fifth time it dragged a heavy catfish up the hill to the trees. The still image, on the other hand, just raises the question: what? Expect to see the leopard fishing footage soon on a show like Big Cats Diary. There were two of us shooting it in 4K, and this went on for three days. Strange leopard goings on wasn’t the only interesting thing I captured on video. These two hippos started an on-land battle on the other side of the river behind the right hippo. What you’re seeing here is the fellow on the left showing submission signs to the victor on the right. That submission session went on for long enough I felt it okay to drop my video camera and pick up the D7200 for a quick shot or two. It was hot in Botswana for August. And Dry. It seems that Summer is Coming had already turned into Summer is Here. 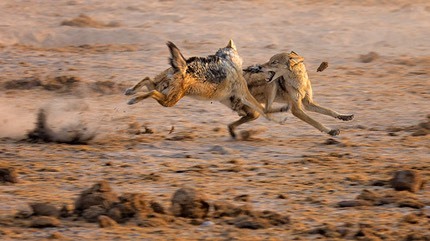 Thus, we were seeing a lot of out-of-season behaviors, including these fellows also doing the “who’s the alpha?” thing. I know you folk seem to get most excited about big cats, so I’ll satisfy you by showing you a pair of pairs. Nothing special here. Just pandering to you cat lovers. What? You want more birds? Did the D7200 do okay? Uh, duh, yeah. And I pretty much knew it would, otherwise it wouldn’t have been my choice. Frankly, if you can’t take good images with a D7200 even in difficult conditions such as those I was in, then I’m not sure you can take good images. 24mp DX is a lot of pixel density, and the D7200’s sensor is state-of-the-art. The focus system is also pretty much state-of-the-art, and now we have a buffer that can handle bursts of raw shots (though I generally don’t do a lot of this). So let me answer the “good photos” question this way: yep, f/5.6 and be there. While I couldn’t have captured these images with my smartphone, you don’t need a D810 and a 600mm f/4, either. What you need is a competent camera and lens plus the knowledge of how to use it. The D7200 did just fine there. How about the 80-400mm? After the sand abuse I’ve thrown at it on the last two trips, it’s going to need a bit of a cleaning, but that’s about all. Because I was shooting video most of the time on this trip, the D7200 and lens were either bouncing around on my lap or on a towel between the front seats while my 4K video camera lived on the door mount. If you know anything about the state of the roads in Moremi, Kwai, Savute, and Chobe, you know that I gave the gear quite a bounce and vibration test. Optically, I really don’t have any complaints about the 80-400mm. Yes, my 400mm f/2.8 is better at 400mm. But no, the 80-400mm is not a slouch, either. I can live with its optical characteristics. Actually, the thing you want to look at in lenses for wildlife is focus performance as much as optical performance. There, the 80-400mm is darned good and fast enough. I never felt like I was waiting for the lens to obtain focus. Ever. Was there anything I was missing in my one camera, one lens kit? Yes, primarily this: the ability to make depth of field more shallow to isolate subjects against backgrounds. Of course, being in control of the vehicle, I could and did control my position quite a bit, which helps, as you can see by the images I’ve presented. Still, the thing I most miss with not using the 400mm f/2.8 is the ability to manipulate the depth of field more when distracting backgrounds show up. If I were just shooting stills on this trip, I would have been using my D810 and the 400mm f/2.8, with backups of another D810 and the 70-200mm f/2.8 and 300mm f/4E lenses. Probably a TC-14E, though I don’t use TCs much any more. But the D7200 and 80-400mm weren’t nearly as much of a compromise as you might think. I’m happy with the few shots I took. And I have to think back to less than a decade ago when I was using a D200 and various fast lenses and still struggling in low light. We’ve come a long way in a short time, and you don’t need the very best gear to experience that.